I finally hopped on the bandwagon of stick foundations and I am so glad that this one was my first choice. 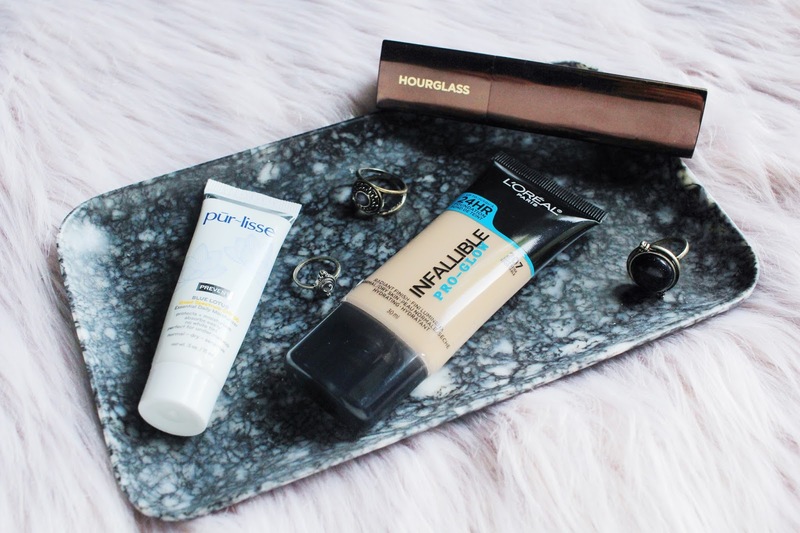 I stand by what I said in my favourite beauty brands post - Hourglass has not and will not let me down! This is an amazing foundation and definitely lived up to all it's hype. When applying it directly to the face, you could already tell how smooth and buttery the formula is. It glides on so nicely that I may even describe it as melting into the face. Blending it into the skin is a breeze as well. One problem I did find with it though is that it doesn't work well with mattifying primers. I used my MUFE Mattifying Primer underneath it and it wasn't pretty. The foundation didn't blend as well and you could clearly see where the foundation was initially applied. That day I drew triangles on my cheeks with the foundation and I spent the day with triangles on my face. So definitely don't use that primer or something similar with this product. Other than that, I'm a big fan of this foundation. It has amazing coverage; I'd say a good medium to full coverage. It looks fabulous on the skin. It still looks the same as when I first applied it at the end of the night. I recommend this to anyone looking to try out stick foundations! After enjoying the Infallible Pro Matte Foundation and seeing a bunch of great reviews on this, I decided to give it a go. The consistency of this foundation is pretty runny compared to my other foundations. I don't really mind it, but if that's something you like or don't like, that's something to think about. Aside from that, it's very easy to blend and it gives me medium coverage, but it is buildable. I love the finish it gives my skin. It's not extremely dewy, but it does give a nice, healthy glow to the skin (hence the name, duh). Although it sounds perfect so far, I have to kill that dream and mention a downer. If you have fine lines, this might not be a good foundation for you. I found that after a while, it settled into my laugh lines..not a good look. Even when I set that area with my Laura Mercier powder, that's still what it results to. Aside from that, it's a pretty good drugstore foundation! I received this deluxe sized sample from BB5's September Box (post here) and have been using it as my main moisturizer this month after my previous moisturizer just stopped working for me. I talked about it a little in this post and shared how I wasn't a big fan of the scent. I'm guessing that's what blue lotus smells like. Though I don't like it much, it's not a smell that lingers so I've learned to deal with it. That aside, it's really moisturizing. Unlike other moisturizers that I've tried, this one does't leave my skin feeling tight or dehydrated and begging for moisture. If you don't mind scents, this would be a great one for you. Another plus side, it has SPF 30!